SKU: MM45-1231 Categories: Christmas Tableware, Red & Green Christmas, Shimmering Silver Christmas, New Years Eve, Silver, Toot Sweet Silver, Paper Plates, Disco, Frozen, Movie, Space / Robots, Winter Wonderland, 1920s Glam, Hollywood, Yellow & Grey, Tableware, ON SALE! Paper Plates ~ Toot Sweet Silver Stripe are classically patterned with silver stripes and a hexagonal profile. 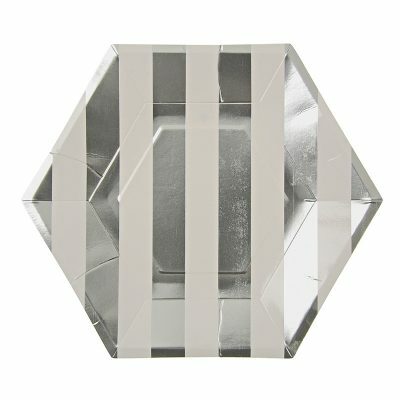 The silver foil embellishments are guaranteed to add sparkle to any party table. A lovely option for a wedding or engagement party.